"You are Tardians, so you live between two shores. If the two shores pressed together, your Tard would come to an end forever." And although the slopes do not merge, waters running down from them to the valley may cause serious demages to the settlement. The comic expression 'Tardlike dew' is still listed in the vocabulary of the neighbouring villages. 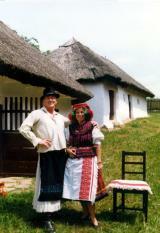 Zoltán Szabó's book about the situation in Tard reads as follows: "Some nearly 200-year-old houses still show the traditional way of building and roof-making in the region. The tops of these houses extend into a semi-circle, and as such widen the eaves. This can be seen on the front wall, where the bottom part contains a bench chiselled into it. It is very peaceful to be sitting around on these benches, sometimes maybe piping regardless of the rain. The windows of these old houses are very small, the walls are very thick. Just as comely they are to the eye, so they are unhealthy to live in. They look very splendid and fit in marvelously with the environment. And to cap it all, there stands the pretty shadoof in front of the house." Regarding its measurements, the inhabitants of the house were most probably rather wealthy, but this is cannot be said of its new owner, the Vajdavice family. That is why we set out to furnish the house in a way that can present the life and taste of the poor peasants of the 1930'ies.